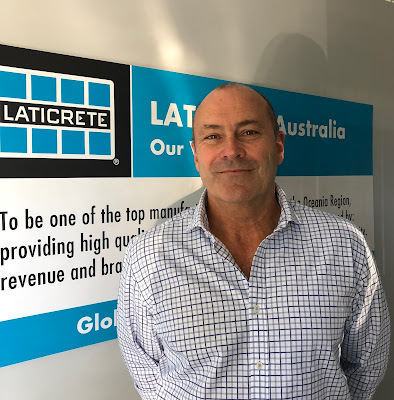 We are excited to announce the appointment of Ross McNeil as the LATICRETE Australia National Sales Manager. Ross brings with him over 20 years of experience of sales management in the construction and building industry. “With a wealth of senior sales management experience within the building and construction industry, Ross has developed and implemented successful sales initiatives and strategies across multiple industrial, commercial and retail construction channels. Ross has 23 years sales management experience within the technical and specification, architectural and trade sectors, specifically within the building and construction industry. This makes Ross a perfect fit for the Australian team” according to Emma Tschannen. As the National Sales Manager, Ross will focus on developing sales strategies and formulating business plans, while driving LATICRETE forward in Australia. As a West Australian, Ross is a passionate fan of the AFL but also enjoys a variety of other sports, including rugby league and union, basketball, motorsports and golf. On weekends when Ross is not driving his teenagers around, he is working on his renovation project in the southern suburbs of Queensland. We wish Ross every bit of success and welcome him to the LatiFamily.